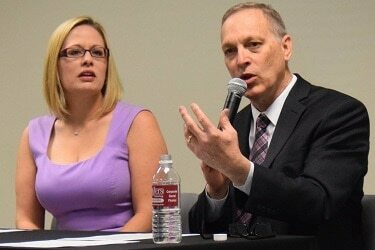 Arizona Congressman Andy Biggs and Congresswoman Kyrsten Sinema shared their insights during the Chamber’s Political Insider Series event. Arizona Congressman Andy Biggs and Congresswoman Kyrsten Sinema shared their insights into the first 100 days of Congress with a packed house of business and political leaders hosted at Southwest Gas Corporation on Friday, April 14. The event was presented in partnership with the Arizona Capitol Times, SRP and Southwest Gas Corporation. The elected officials focused proposals that have and haven’t worked, how each party is working to advance its goals in the new Washington and even highlighted several proposals on which both agree. View the event photo gallery. See the video below for a quick recap.